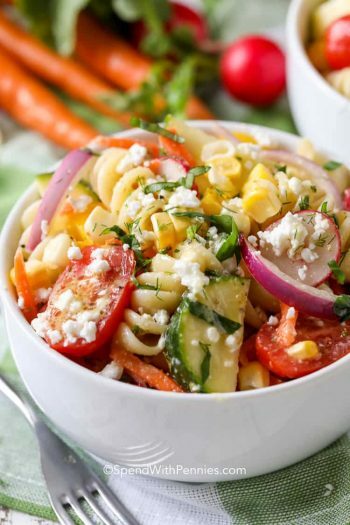 Carrot Salad is a side dish that’s bright tasting and bursting with goodness and flavor. 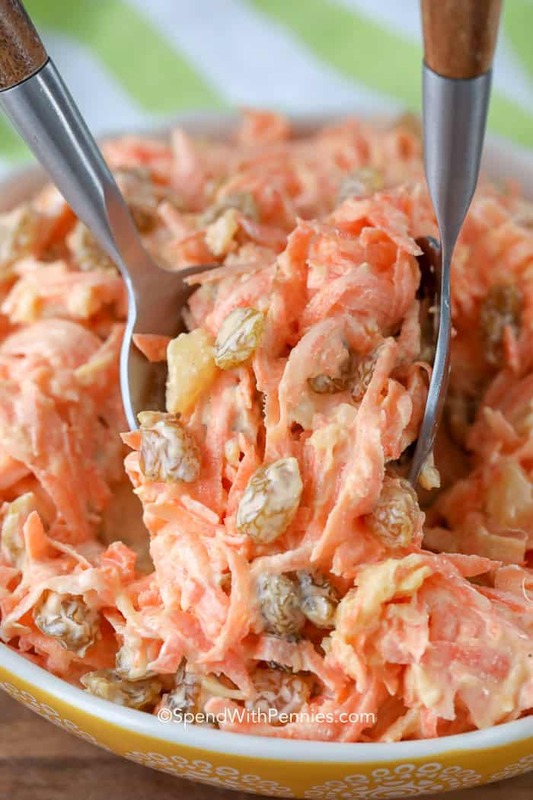 Shredded carrots, pineapple and raisins are tossed in a simple creamy dressing. 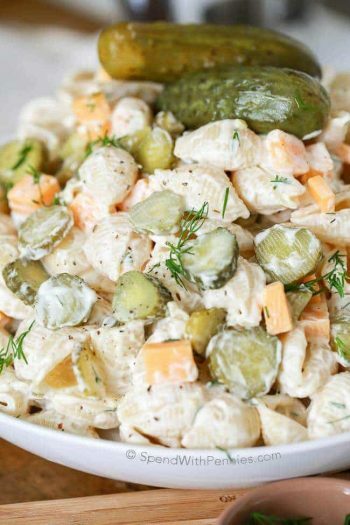 This fresh alternative to a classic coleslaw recipe is a simple dish, and one that’s coming back into style. 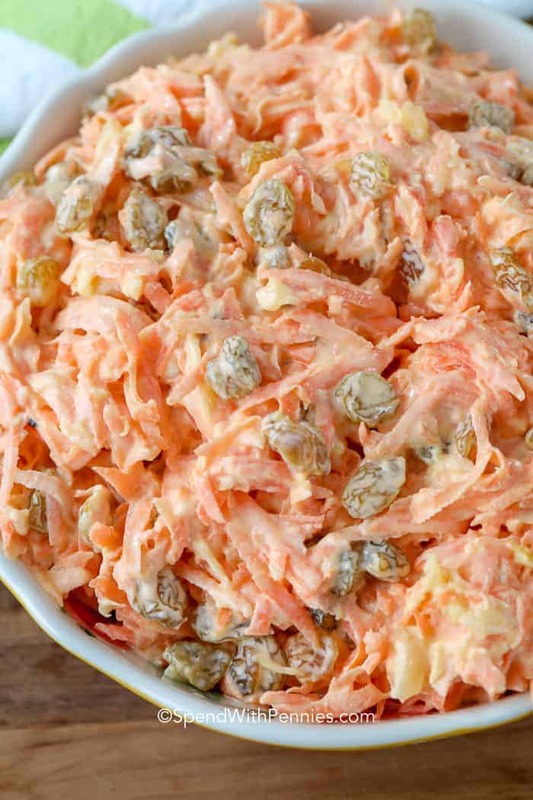 Once you try this carrot salad recipe you’ll see why. It seems like carrots are often overlooked as the central element in a dish, but they shouldn’t be. We use them all the time! From glazed carrots to roasted, they are inexpensive, and available year round and keep for ages in the crisper section of your refrigerator without losing their sweetness or crunch. This is a simple dish to make, especially if you have a food processor! If you don’t have a food processor, a cheese grater works just fine! Refrigerate for at least an hour so the flavors meld. 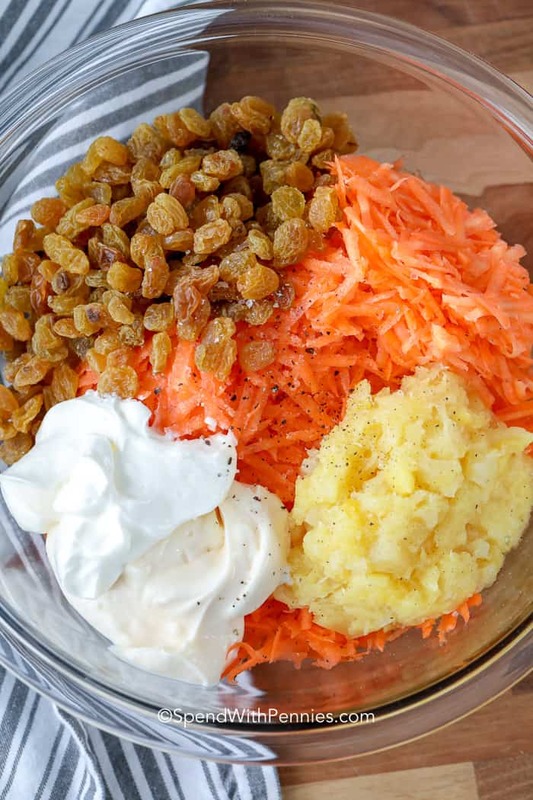 Ingredients in carrot salad include raisins, sour cream, mayonnaise, pineapple and a hint of vinegar. We use canned pineapple but if you have fresh on hand, chop it finely and use that! A delightful and exotic variation is Moroccan carrot salad! In this version, you would use lemon juice instead of vinegar, a clove of minced garlic, and cumin and cinnamon spices. This is one recipe where a knife alone won’t do. You’ll definitely need a shredding blade of some kind to get the carrots just the right softened texture. Shredding blades are found on mandolins, box graters and food processors. Food Processor: Cut the tops and ends off each carrot and cut into 2-3 inch pieces. Fit your food processor with the shredding blade and pulse until shredded. Box Grater or Mandolin: Simply wash, peel and cut the tips off the carrots, but don’t cut into pieces. It will be much easier to shred them while they are still whole.Box graters and mandolins have two shredding sizes. You’ll want to use the larger one. The finer blade turns the carrot to a messy pulp. Be prepared for a good arm workout! Shredded carrot salad can be made ahead, and leftovers will keep for about three days in the refrigerator. 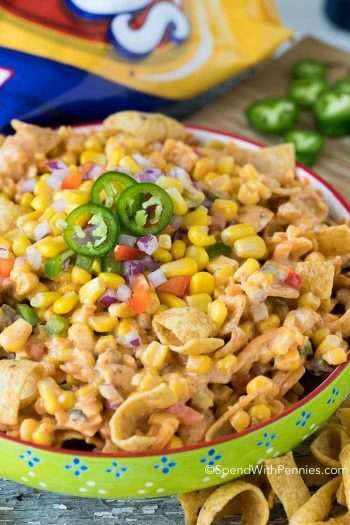 I wouldn’t advise freezing it though as thhe sour cream can separate and curdle. But guess what? You can freeze raw shredded carrot! Just place any unused portion into a plastic freezer bag and it will keep for up to four months. Add the shredded carrot to soups, Chicken Stew, casseroles and more! 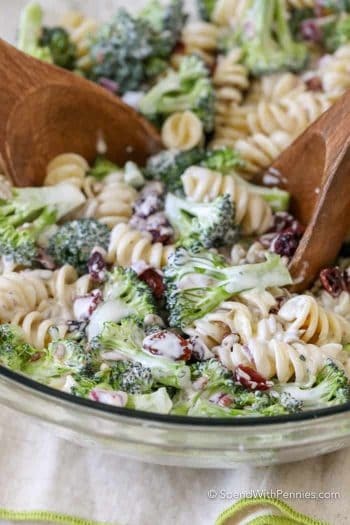 Millionaire Cranberry Salad – great for potlucks! 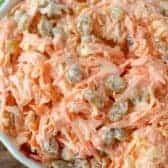 Shredded carrot and raisin salad is a sweet and savory side dish, and great for enhancing meaty entrees. 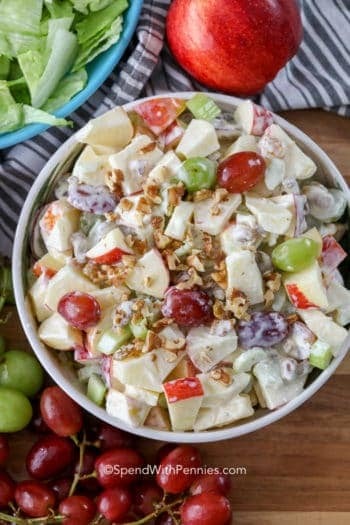 Serve it with something succulent and savory, like pulled pork barbecue, rotisserie chicken or ham. 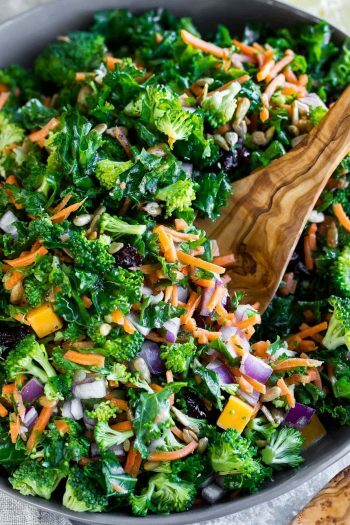 If you’re looking for a side dish that’s bright tasting and bursting with nutrition, you’ll love this carrot salad.